The Religion Program for our students from Pre K to 8 is sequential. Daily instruction is based on factual knowledge of our Catholic faith, and on the spiritual development of each child through prayer and worship; outreach is a priority. Students are assessed annually on their grade level using basic faith facts. Learning is enhanced through audio visual materials, bibles, and the use of the Internet. 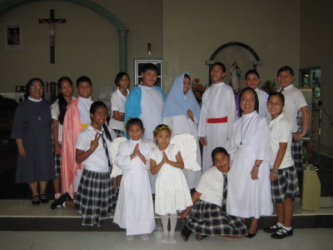 Eskuelan San Francisco de Borja is blessed with a prayerful atmosphere which is further developed with Friday Liturgies, and Para liturgies connect the students with the liturgical year. As a result of this faith development, the Spirit in each child is stirred to respond to our many outreach programs and to become responsible members of the Church and local community. Throughout the grades, students receive age-appropriate instruction in reading, writing, listening, ad speaking. Students develop necessary skills as they are exposed to the best in written and oral expression. As they advance through the school, students are encouraged to read critically. Teachers challenge students to interpret and respond to various forms of literature. Study of the best classic and contemporary novels enhances the regular language and literature series. Lessons help students sharpen their usage and mechanics as they learn to communicate through writing poetry, essays, and narratives. The math curriculum is maintained through various forms of assessment by the teachersl. Each grade level incorporates various techniques of instruction. Teacher directed instruction, the use of manipulative, overhead projectors, chalkboard, calculators, computers, and videos are among methods used. Some students participate in an advanced math program in grades 5-8, which enables them to learn Algebra 1 in eighth grade. Moreover, involvement in cooperative groups, consistent use of critical thinking skills, hands on manipulative and mastery of basic math skills foster the understanding of math concepts on all levels. As Catholic educators, the faculty strives to provide all students with the opportunity to become scientifically literate. All science students are actively engaged in questioning, predicting, investigating and analyzing data. The scientific method and independent thinking skills are used to approach problems in an organized, logical manner. Students work in cooperative groups on inquiry based, hands-on laboratory experiences in our science classroom. They are introduced to the identification and proper use of basic science equipment. Areas of study include life science, chemistry, physical science, ecology, weather, geology, genetics and others. Students develop an appreciation of the aspects of science they encounter in their daily lives. The Social Studies program is sequential from kindergarten through eighth grade and emphasizes historical and geographical understanding while promoting citizenship and respect for peoples of all nations. Students begin with an awareness of the need for rules and family; then focus on community, state, national and world regions. Students engage in debates, discussions, role-playing, simulations and Internet research. They read novels related to historical events and write short stories and letters from the perspective of that time period. Students use artistic talents to create historical cartoons and geography games. The program is further enhanced with music related to regions or times, guest speakers such as re-enactors and local government leaders, weekly newspapers, and field trips related to topics in the curriculum. With the growing of the Information Age, Eskuelan San Francisco de Borja highly values technology education for all grade levels. In computer class, students in 3rd to 8th grade learn about the basic computer parts, and how to use a mouse and keyboard by engaging in a variety of learning-based activities. Proper keyboarding skills, become familiar with the basics of Microsoft Word, Excel, and PowerPoint, and learn basic navigation skills on the Internet. The upper grades learn to value the Internet as a research tool, while also becoming proficient users of Microsoft Office software. Projects and activities in computer class correlate with other subject areas in order to demonstrate our most important objective: knowing how to use technology as a tool for learning. The Chamorro Language class at Eskuelan San Francisco de Borja provides students in grades 3rd to 8th an opportunity to learn Chamorro vocabulary, grammar, and syntax, while simultaneously acquiring proficiency in reading, writing and pronunciation of the Chamorro language. In addition to the language, students also learn about various aspects of culture and geography, through presentations on various holidays and traditions that are specific to the Commonwealth of the Northern Mariana Islands that make up the Chamorro speaking world. The children in the Art program at Eskuelan San Francisco de Borja study art theory art as a career, and as an investment. The children start in Pre-K with basic skills and art theory. As they continue with the program, they begin to feel the self-confidence that comes from the knowledge of art theory and art history, which they apply as they create art projects with pride. The focus of Music Education in Eskuelan San Francisco de Borja is to help each student explore the vast world of music with appreciation and understanding. Music classes in grades Pre-K through 8th grade provide opportunities for students to explore themselves and their world through music. They build a foundation of musical experiences including singing, playing instruments to accompany their singing, creating music, responding to music through movement, and connecting musical sounds with written music symbols. In the middle grades, students expand their study of music though Religion music, music of other cultures and time periods, playing recorders, and more advanced singing in parts. In the upper grades, students experience and study the music of some of the great musicians. Music classes at this level are also correlated with content in other subject areas, particularly Religion. In addition dance numbers are in corporated for programs such as the schools annual Spring Concert event. Physical Education and Health is a vital part of Eskuelan San Francisco de Borja's educational program. We recognize that the student's well-being is enhanced by regular physical activity and healthful living. To this end, our Physical Education and Health Curriculum teaches the knowledge, skills and values necessary to maintain a healthy and physically active life. Physical Education and Health provides a comprehensive, district wide Curriculum for Wellness. Our Physical Education and Health Goals is to develop within our students the lifetime desire to maintain healthful physical fitness levels, to develop within our students the fundamental motor skills for successful participation in a wide variety of physical activities, to develop within our students the competence to participate in physical activities throughout their lives, to develop within our students an appreciation of wellness and a desire to pursue wellness throughout their lives, and to develop within our students a sense of personal worth, a respect for others and a desire to be a socially responsible citizen.